Sounds like Netflix is doing pretty well these days (click here). Remember when Netflix changed DVD and Streaming pricing strategies, back in 2011? The change was considered a social media disaster. How Netflix Could Have Avoided Social Media Disaster (click here). 7 Rookie Social Media Mistakes From Big Brands (click here). You can commit the most shocking social media disaster of the year, and it has no impact on sales and profit in the long-term. A small and passionate group of social media zealots should not stall business decisions you believe in. Focus on merchandise presented creatively. Focus on the future of your business. That's what we know. Nearly twenty years ago, J. Peterman was the toast of the town. Why was J. Peterman, a $75,000,000 business back in the day, popular in the first place? Was it omnichannel? Heck no, the prior version of omnichannel, called multichannel, bankrupted the company. Go ahead - read this little ditty (click here) and think about what Mr. Peterman says about running a business. "I didn't know how to set up a warehouse." "I didn't know how to set up a distribution system." Pretty soon, he opened 15 retail stores. The faster it grew, the more cash he needed, and before he know it, the company was bankrupt. Why I am referring to something that happened nearly 20 years ago? Because it is happening again, today. You're getting the same kind of advice. "Be social, be authentic". "Brands that don't embrace digital will surely die". "Let your customers do the marketing for you." "Trust the cloud." "Omnichannel customers transact everywhere, and are worth 29 times as much as average customers." If you aren't going to have the lowest prices and the best customer service (hint - Amazon), then you need a different approach. J. Peterman sold oxford shirts, just like everybody else. But the creative presentation was so over the top that you purchased because of it. Instead of focusing on the next big idea, why not focus on selling merchandise in a creative manner? Instead of channels, why not tell a story? And then, when sales take off, make sure the fundamentals of the business are well taken care of. With all of the profit you earn, you can invest in a dreamy, omnichannel solution. Omnichannel: Are #Omnichannel Customers Truly More Valuable? The most popular meme in retail is "omnichannel". The theory posits that by aligning all channels around the customer, by creating a consistent experience across all channels, by tearing down silos inside organizations, by integrating a digital experience in-stores and online, by fully integrating mobile into the customer process, retailers get to reap the rewards of a customer demanding a fully holistic purchase experience. You'll have to look hard to find any researcher or vendor who has proof that this strategy leads to a dramatic increase in profitability. This is where the research ends. A simplistic query is run, and of course, there's clear proof that customers who shop many channels spend much more than customers who only shop a small number of channels. In this query, 0-3 month buyers were chosen. 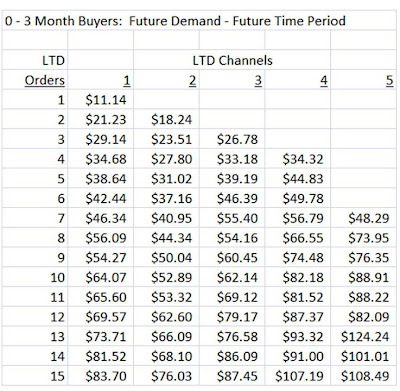 Then we measure historical channels purchased from, and we measure how much customers spent, historically. Researchers need to go one step further, don't they? Given that a customer is an omnichannel customer and has the same frequency as a single-channel customer, can we prove that omnichannel leads to increased future spend? 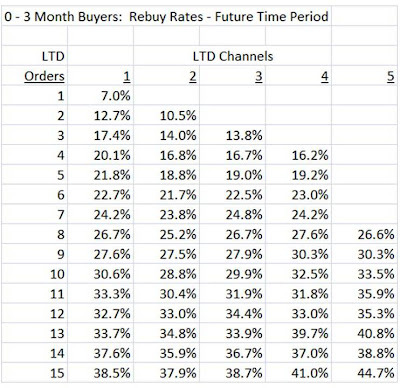 This table measures repurchase rates in the next month, after controlling for historical frequency, and for historical number of channels purchased from. We're still evaluating 0-3 month buyers. What do you observe, in this table? Look at a customer with 6 life-to-date orders. Read across the table ... these are customers who purchased from 1, 2, 3, 4, and 5 historical channels. 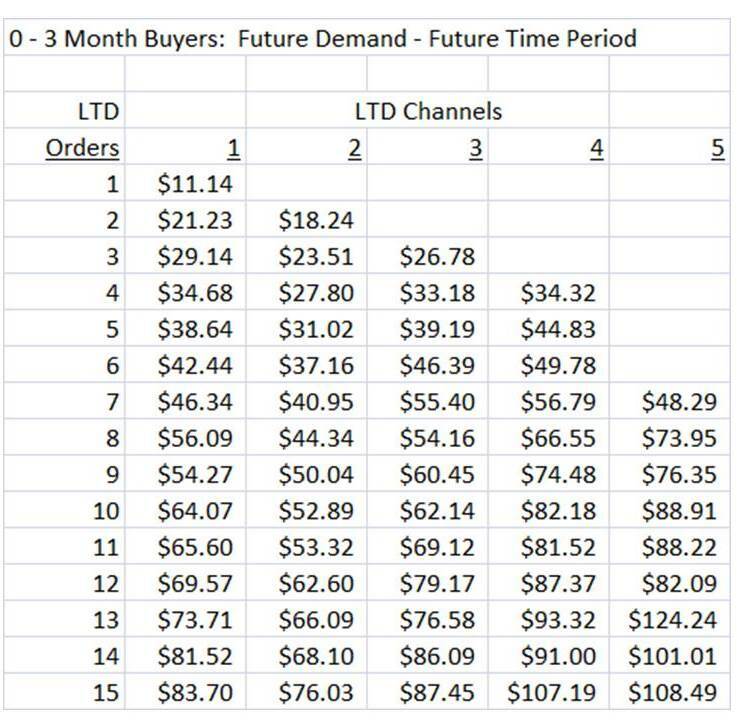 The customer buying from 5 historical channels should be much more valuable than the customer buying from 1 historical channel, correct? 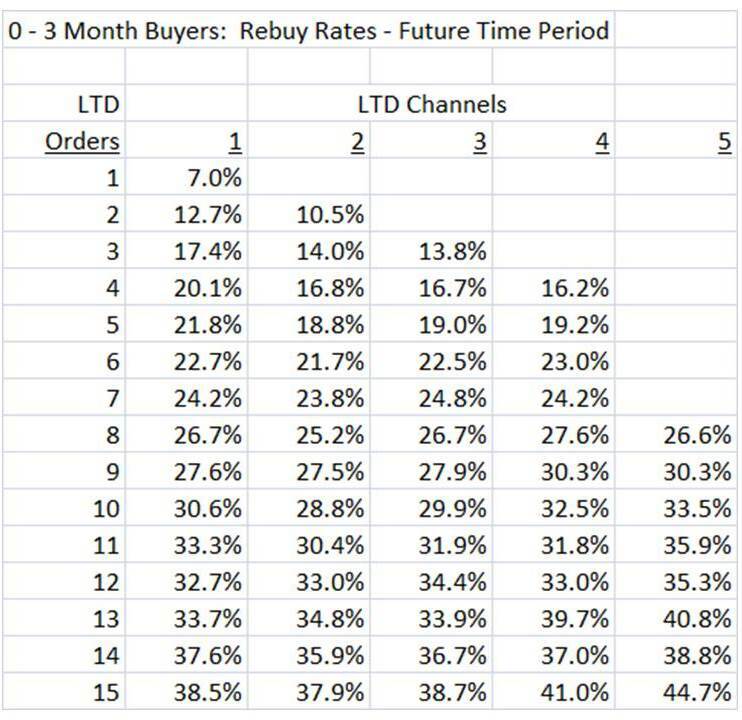 In fact, you have to get to 10 historical orders, and 5 historical channels, before you start to see an increase in future repurchase rate. 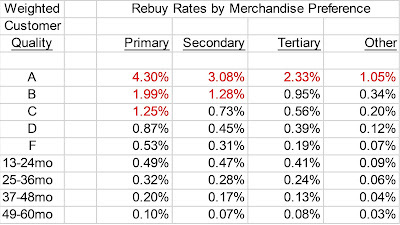 Let's look at future spend, not future repurchase rate. 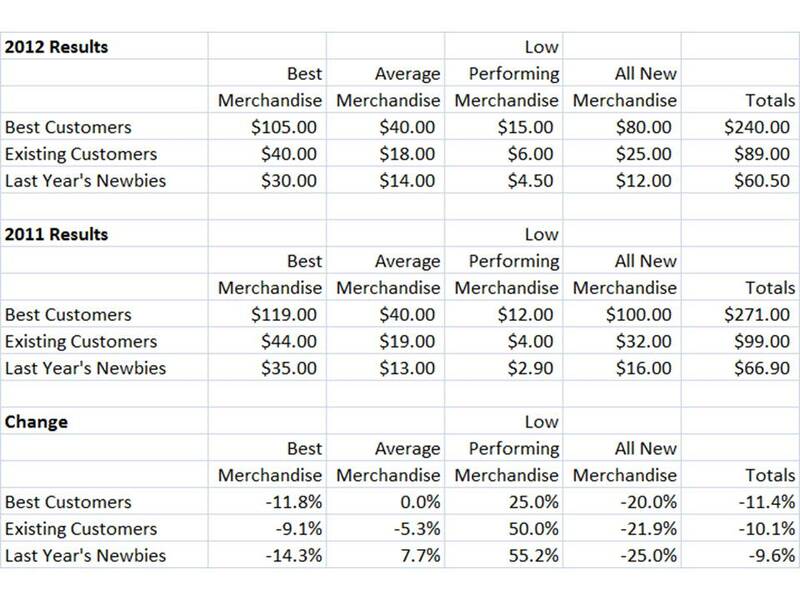 Average spend (no repurchase = $0, averaged with those who do repurchase) illustrates that there is some incremental value to getting a customer to purchase from multiple channels. Read across the Life-To-Date Orders = 6 row. You see that four channels are better than 1-3 channels ... mind you, only 20% better, but it's still better. But there are quirks, aren't there? Read across the Life-To-Date Orders = 3 row. Here, buying from one channel is better than buying from three channels. Read across the Life-To-Date Orders = 2 row. Here, buying from one channel is better than buying from two channels. For this retail brand, when a customer is early in the life cycle, omnichannel behavior is counter-productive. For this retail brand, when a customer is deep in the life cycle, omnichannel behavior is more productive, but only 15% - 25% more productive, not 7 times more productive as is commonly published. Run these queries for your business. Seriously, go run them. You'll see similar results. Of course, your mileage will vary. If your results look something like what I've illustrated above (hint - they will look similar to this), then there are a whole bunch of interesting strategic questions that need to be asked. Strategic Question: If most of my customers have 1-3 historical purchases, and the gains promised from omnichannel come from customers with 10+ historical purchases and 3+ historical channels, and the gains are in the 15% - 30% range (not 700% or 800% as promised in omnichannel literature), then of what benefit is an omnichannel strategy? Strategic Question: If the gains are in the 15% to 30% range, wouldn't I be better off investing in 1 new customer, so that I have 2 customers, than to re-arrange every process in my company so that I have 1 customer spending 15% to 30% more - only if the customer makes it deep into the life cycle? Strategic Question: If the payback of an omnichannel strategy is 15% to 30%, only among the 5% of customers who ever make it deep into the customer life cycle, then why should I tear down all silos in my company and work terribly hard to integrate all of my processes around digital channels? Strategic Question: What do Forrester Research, IBM, HP, and any other vendor promoting omnichannel integration have to gain by getting you to reinvent your entire business around a concept that only pays back 15% to 30% among the 5% of your customer audience that is deep into the customer life cycle? Use the comments section to offer your thoughts. Provide links to research that complements or refutes the information presented here. And if you're looking for help determining if omnichannel is right for your retail brand, click here to email me, now!! Yesterday, I wrote about the two topics that are buzzing around the catalog vendor community this week (click here to read the blog post). Possible requirement to collect sales tax. 100% of the feedback came from vendors in the catalog industry, and it was largely opposite of my point of view. 0% of the feedback came from actual catalogers. Let's address the feedback I received, in the Frequently Asked Questions (FAQ) format. If catalogers are required to collect sales tax, annual sales will be hurt, that's a no-brainer, correct? Maybe. Maybe not. Time will tell. I have measured the phenomenon for many retailers. Retail brands open new stores in new markets all the time. They will open a store in Omaha, and as a result, be forced to collect sales tax in all of Nebraska. In the vast majority of cases (in fact, I cannot remember a case where this didn't happen), the e-commerce side of the business takes a brief sales hit, then sales recover within a short period of time (often 60-90 days), and return to prior levels. In other words, there is no long-term impact on e-commerce sales. Your mileage may vary. Remember, 85% of most sales still happen in stores ... where customers willing pay sales tax. Please keep that fact in mind - we're in a world where you can get free shipping and no sales tax, and yet, 85% of sales still happen in retail stores, where you have to pay for gas, invest time, and then pay sales tax. Did you stop purchasing MP3s from the iTunes store when Apple opened a store in your market? Did you switch to Amazon, who offered the same item at the same price with no sales tax, or did you continue to purchase music through the iTunes store? Be honest! But if catalogers have to collect sales tax, at scale (i.e. everybody), then the result is different, correct? When everybody has to do it, won't annual sales take a 5% or 10% hit? Maybe, maybe not. When the depression started, back in Q4-2007, weak businesses were literally pushed out of business, while strong businesses (hint, Amazon) steamrolled along. Issues do not hit all companies evenly. If we assume that collecting sales tax will result in a dire outcome (retailers have suggesting the result is not dire), why will it happen evenly, across the board? Might the issue push a weak business into the ground, re-distributing the demand from the weak business among strong business, thereby having no impact on strong businesses? That's what happened during the depression of late 2007 - mid 2009, right? Weak businesses ceased to exist, strong businesses re-calibrated and moved on. But sales tax collection is currently illegal, we can't just let our laws change, we'll damage society and hurt the consumer, right? It used to be illegal for women to vote. Our response to change is more important than the change itself. Remember, you have a control group ... states like Oregon that you'll be able to measure results against. If the USPS raises rates, won't that cause catalogers to go out of business? The USPS raised rates in the past, correct? How did that impact your business? Did prior rate increases cripple your business? I don't think you understand, Kevin. The combination of sales tax and catalog rate increases is like an additional 25% tax on catalogers. The impact will be fatal. This will not be fatal to catalogers. This might be fatal to weak catalog businesses that sell merchandise that customers largely ignore. Identify channels that your target customer shops in, and take advantage of those channels. Your blog is widely read, and you're spreading misinformation out there to a large audience. Why? I am sharing actual project findings, based on actual customer behavior. I have mail/holdout tests on my side. I have e-commerce results from retail store brands forced to collect sales tax in markets where they previously did not have to collect sales tax. I participated in the shut-down of a catalog division among a Jennifer-focused customer audience, and watched annual net sales increase on a $36,000,000 catalog ad cost reduction - think about what that does to the profit and loss statement? I care deeply about my clients, and the catalog industry. That's why I share actual facts, not memes. Let's bring facts, based on actual purchase data from retailers, e-commerce brands, and catalogs, to the table. Logically, it makes sense that these forces are going to destroy catalog marketers, right? Since many of you are from New England, go talk to your friends at L.L. Bean (they are not a client of mine). Ask L.L. Bean if their catalog business was crippled when they were forced to collect sales tax when they opened stores in new markets? Ask L.L. Bean what impact the 294 prior USPS price hikes had on their catalog business? Use L.L. Bean as a case study for how catalogers might respond to drastic changes. They were not pushed out of business. Give L.L. Bean Management a call, and have a discussion with them. Get facts from somebody who has lived with the consequences of a sales tax burden. Doesn't the customer need catalogs to shop? Sales Tax + Postage Increases = Fewer Catalogs and Fewer Shoppers, Right? Ask Amazon if their customer (hint - that's everybody) needs a catalog to shop? Does Amazon's customer in Washington State, where Amazon must collect sales tax, spend so little that it devastates Amazon's profit and loss statement? If your customer is June / Judy (age = 69-85, 52-69), yes, mail/holdout tests prove that this customer will shop less if you stop mailing her catalogs. For this customer, sales tax increases and USPS postage increases could cause problems. If your customer is June/Judy, ask yourself why you aren't supporting the ACMA? 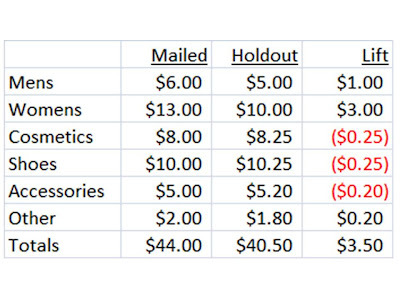 If your customer is Jennifer / Jasmine (age = 36-51, 20-35), mail/holdout tests prove that this customer will continue shopping with your brand, but at lower rates (Jennifer) or will be barely impacted at all (Jasmine) if you stop sending catalogs to her. 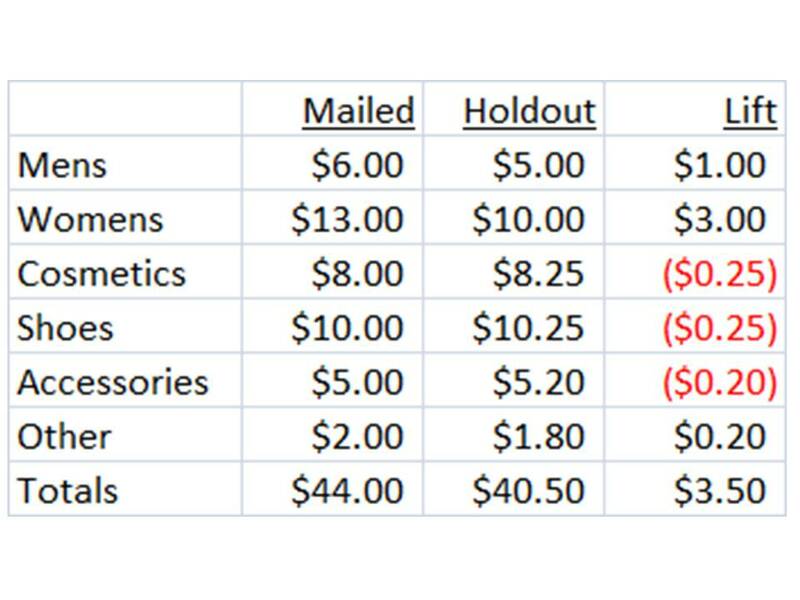 If your customer is Jennifer / Jasmine, go tell the USPS what to do with proposed rate increases ... tell them you'll stop spending money with them and you'll reinvest your marketing dollars in the channels that Jennifer / Jasmine use. If your customer is Jennifer / Jasmine, you are in a position of power with the USPS. We need to stop acting out of fear. We need to use the power we have to make a statement. If the customer is Jennifer or Jasmine, we don't have to send catalogs to her. I thought you were a defender of the ACMA? If you are a cataloger who caters to June / Judy, I don't like the fact that you don't support the ACMA!!!!! But if you are a cataloger who caters to Jennifer / Jasmine, the world has changed, and your customer changed. Print is no longer the driving force for Jennifer, and is close to irrelevant to Jasmine. And I have data to prove it, via mail/holdout tests. I know, some of you think I picked the wrong side of a fight. I picked the right side of the fight. I chose data, facts, analyses, and mail/holdout tests, to determine my position. Ask yourself what happens to the co-ops if fewer catalogs are mailed, thanks to the USPS, thanks to having fewer current buyers due to sales tax increases? Ask yourself what happens to printers if fewer catalogs are mailed, thanks to the USPS? Ask yourself what happens to whatever is left of the list industry if fewer catalogs are mailed, thanks to the USPS and sales tax changes? Now ask yourself how you will respond? You won't go out of business. You will make strategic changes. If your customer is June / Judy, you'll make one set of changes. If your customer is Jennifer / Jasmine, you are already making changes that the catalog vendor community is not thrilled about. I'm just asking you to use data and facts to see issues more clearly. It's a lazy Friday, and then, all of a sudden, the emails pour in from the vendor community. Subject Line = "URGENT CALL TO ACTION: ACT NOW TO SAVE YOUR BUSINESS". Comments: "POSTAL, TAX CRISES GO FROM BAD TO WORSE, CATALOGERS MUST BE HEARD FROM TODAY". The original email message comes from the ACMA, an organization trying to protect your future via lobbying efforts. Unfortunately for the ACMA, almost no catalogers pay the nominal fee to support the ACMA. I worked at Eddie Bauer and Nordstrom - it was my job to analyze the impact of sales tax collection on e-commerce / catalog transactions when we opened a new store in a state where we previously did not have a store. Yup, you open a store in Omaha, and you have to collect sales tax on e-commerce transactions in Ogallala. Not Council Bluffs, just a mile away, mind you, unless you have a store in the Quad Cities, five or more hours to the east. Fun stuff! After about 90 days, sales rebounded to normal levels, and did not change. I've analyzed this issue under the MineThatData umbrella - no impact. If retailers can collect sales tax and not experience a sales decline, so can you. It's not the end of the world to manage a table of 45,000 zip codes with unique sales tax rates. In other words, don't listen to the hype and dire predictions. It's nonsense, validated by data ... Amazon doesn't struggle in Washington State, and your sales won't struggle, either. If you have data to counter this, please present a white paper to me (email me by clicking here), and if the math is credible (i.e. not a survey of 994 likely customers conducted by a research firm), I'll publish it for 3,000 blog subscribers and 4,600 twitter followers to evaluate. Issue #2 - postage increases. Here's the thing - welcome them! When the increases come, you cut back on circulation among Jennifer/Jasmine, you barely lose any sales, you increase profit, and you reinvest the profit in the online future of your business. How is that a bad thing? Your vendors raise prices on you, and you deal with that without lobbying Congress. If the USPS jacks up rates, stick it to them - mail less - mail much less. Reinvest the money on Jennifer/Jasmine, and build the online future of your business. Instead of acting out of fear, why not act out of a position of power? You have power, not the folks the ACMA is lobbying to. You decide where to invest your marketing dollars. And if you believe in catalogs as your preferred marketing channel, then why the heck aren't you investing in the ACMA? Catalog Marketing - Profit Means Everything! You see it everywhere you go ... profit just laying on the ground ... with nobody motivated to bother to pick it up and stick it in their wallet!! When a business is dysfunctional, profit leaks out, everywhere. From analysts choosing to measure "conversion" instead of profit to email wonks looking at opens/clicks/conversions to cloud-based catalog circulation folks, we barely bother to measure profit. 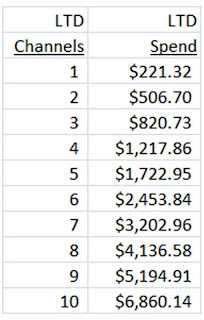 Internally, we lack discipline ... high return rates, high pick/pack/ship expenses, all of it hurts the p&l. Look at this example ... the first company does a credible job of generating profit ... with 45% of demand flowing through to profit. The second company lets profit leak, or they fail to measure profit accurately and just stick a "40%" factor into their decision-making processes. The first company, with a 45% profit factor, can mail down to 1,800,000 circulation depth ... generating $4,024,922 demand. 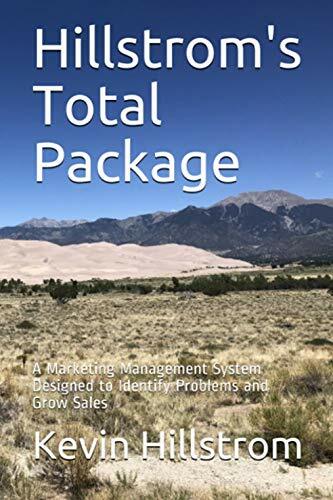 The second company, with a 40% profit factor due to either a leaky profit bucket or an analyst making a random, arbitrary 40% profit designation, can only afford to mail 1,400,000 customers, generating $3,549,648 demand. Which business would you rather be part of? I'd pick the first business ... the focus on profit allows the business to generate 13% more demand. If the second business has a leaky bucket, then this is the true impact on the business. 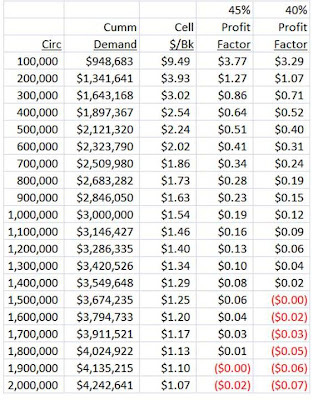 Scenario #1 = $4,024,922 demand, 40,249 orders, $911,215 profit. Scenario #2 = $3,549,648 demand, 35,496 orders, $719,859 profit. 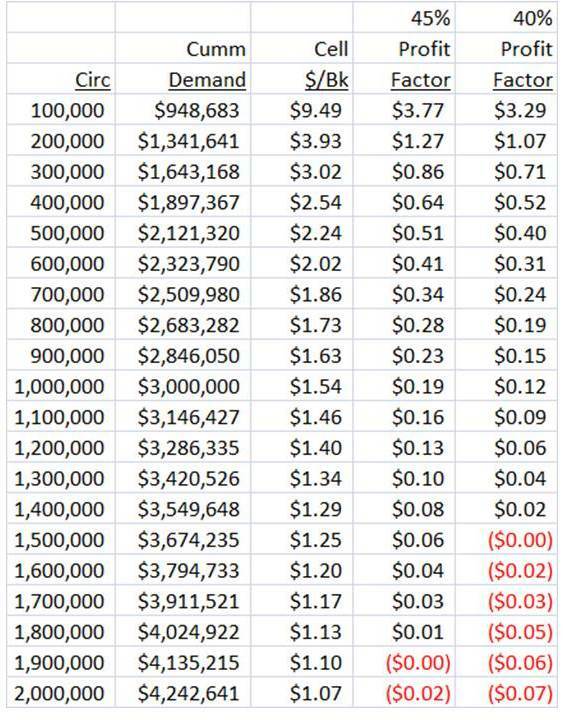 Scenario #2 = $3,549,648 demand, 35,496 orders, $897,342 profit. The first example is the fault of every employee in the company, the penalty for being sloppy. The second example is the fault of just one employee, making a bad decision estimating how much demand flows-through to profit. If this company sends 10 mailings a year, then one analyst, one individual, is costing the company $5,000,000 in annual demand - 50,000 orders (and likely, 40,000 customers who would generate incremental future profit), and $140,000 annual profit. One analyst - acting alone, costing the business a 13% sales increase. In catalog marketing, profit means EVERYTHING! There is no margin for error, there is a discipline that must be adhered to - without discipline, the business suffers - just because of one or two people. And if you outsource your catalog circulation efforts, well, just how much attention to detail do you think you're getting vs. in-house resources? Your outsourcing efforts could easily harm your business by 10%, if you are not telling your cloud-based circulation experts how to execute every single aspect of circulation management. Catalog Marketing - Profit Means Everything! Maybe business is in the tank because of a lack of discipline around measuring profit? I can't stress the importance of weighting transactions. So many of the tactical mistakes we make come down to over-estimating the importance of prior customer activity. Example: Customer spent $100 via phone 5 years ago, spent $100 online thirty months ago, and spent $100 via a tablet today. Best Practice Thinking: This is an "omnichannel" customer, one that does everything, one that should be marketed to via old-school and modern techniques. 0-12 Months Ago --- Weight = 100%. 13-24 Months Ago --- Weight = 50%. 25-36 Months Ago --- Weight = 25%. 37-48 Months Ago --- Weight = 15%. 49+ Months Ago --- Weight = 10%. Tablet Transactions = $100 * 1.00 = $100. Online Transaction = $100 * 0.25 = $25. Phone Transaction = $100 * 0.10 = $10. From a weighted perspective, this customer is 74% tablet-focused. Your marketing strategy for a customer 74% tablet focused is very different than your marketing strategy for a customer that is 33% tablet focused. I want to wrap up this series by analyzing four unique channel pairs. 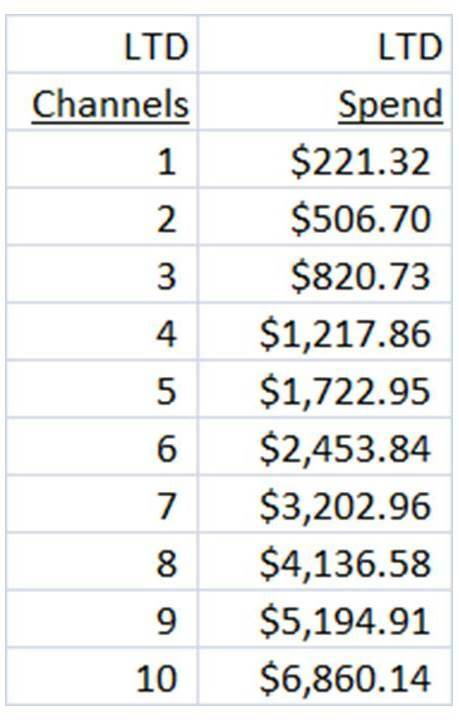 Take a look at any row in the table that has "None" in the second column. These are customers that only buy from one channel. 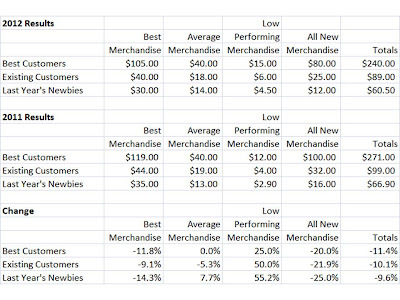 By the way, the majority of customers in your database only buy from one channel. We spend all of our time analyzing omnichannel customers, when in reality, we should be spending a disproportionate amount of time analyzing single-channel customers! Retail Only Buyers: 95% of future demand is in-store. This tells us that, for these customers, digital is there to support the in-store experience. I know, the experts don't want to hear this, but analyze your own data, and you're likely to see a similar outcome. For retail brands, most of the customers are retail-only, and most of the future sales from this audience are in-store. The digital experience supports in-store purchasing activity, an important strategic finding. E-Commerce Only Buyers: 58% of future demand is via e-commerce, while 11% is via tablets/mobile. About 20% of future online activity is bleeding out of e-commerce, into newer digital channels. 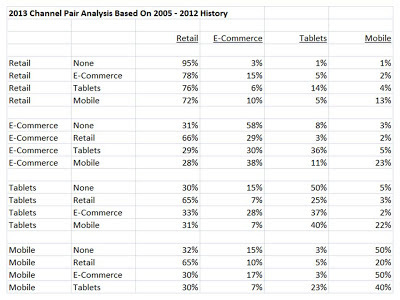 Unless mobile/tablet customers migrate back to e-commerce at the same rate, e-commerce is dying a slow death. You don't hear the pundits talk about this, because, well, digital advocates just don't want to believe this finding! Go look at your own data. What do you observe? Tablet Only Buyers: 50% of future demand is via tablets, 15% via e-commerce ... ok, this is a very interesting finding. 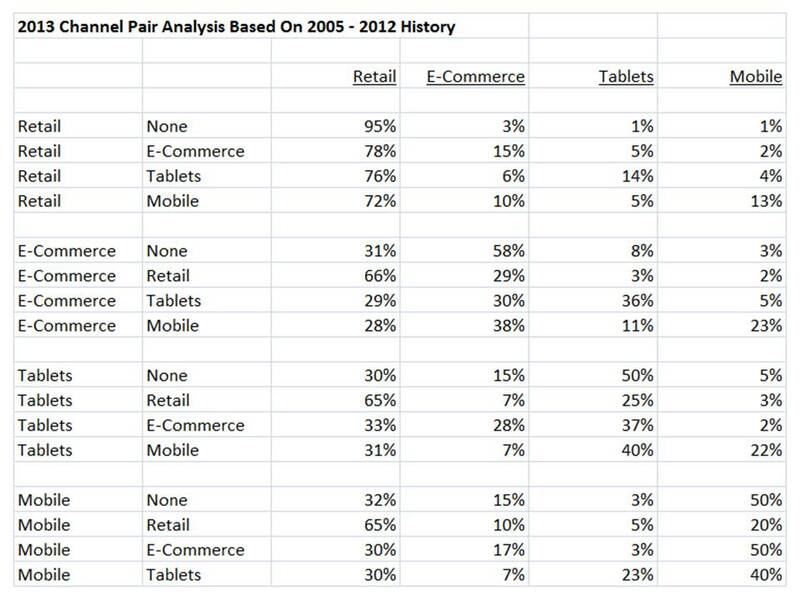 In reality, tablet customers are switching to e-commerce at FASTER rates than e-commerce buyers are switching to tablets. We just validated the opposite hypothesis! Now the new media pundits will get frustrated! This finding tells us that e-commerce customers want to try tablets/mobile, but may find that experience not fully developed, driving customers back to e-commerce. Mobile Only Buyers: 50% of future demand is via mobile, 15% via e-commerce ... again, the customer is actually switching back to e-commerce faster than e-commerce customers are switching to tablets/mobile. So this analysis didn't go where I thought it was going, when I reviewed e-commerce only buyers, did it? Fascinating! At this time, customers are switching from tablets/mobile to e-commerce faster than they are switching from e-commerce to tablets/mobile. By the way ... the relationships in this table (above) are very, VERY similar to the relationships observed when e-commerce broke on the scene in the late 1990s ... customers left the call center to try e-commerce, then shifted back to the call center. This trend didn't hold - that's why you run this analysis every month/quarter, to understand how customer behavior is shifting. Yup, you heard the news ... Ron Johnson out at JCP (click here for details). First of all, there are way too many people out there cheering this news. Have you ever been fired? How did it feel? You pour your heart and soul into a job. More than a hundred million dollar golden parachute may soften the blow, but it doesn't soften the impact on the ego. Try pouring your heart and soul into a new strategy, try changing the minds of tens of thousands of employees sometime ... seriously, give it a try. It's terribly hard work, and when it fails, it eats at you. Second, there are way too many people out there who, based on tweets, blog posts, and articles, appear to believe they know how to fix JCP. Good! Why not dive into retail and prove if your hypothesis has merit? It is way, way too easy to stand outside of an industry and point at it and beat it up publicly in an effort to generate page views that you directly benefit from. It is terribly hard to fix real world problems. Third, JCP wasn't exactly thriving prior to this dramatic change in strategy. Have you looked at the five year sales trajectory? In other words, if you go back to what "worked" previously, you're back to a compound average -3.5% comp store sales decline. Is that the success you crave, now that the CEO you didn't like got fired? Not exactly a resounding four year trend prior to 2012, correct? This was a business that was dying prior to the major changes we've all heard about. So if you are an expert, you now have two problems to fix ... the old one, and the new one. Fourth, many of you suggest that JCP should have "tested" their way into this strategy. Not a bad idea. But that's not how the real world works. Let's say they did test ... rolled out a new strategy in all stores in California, for instance. What do you do when the rest of the store profile is dying a slow 4% death? Try having patience when others scream at you at 110db, spittle flying everywhere. Human nature has little tolerance for the slow, incremental progress of testing. Retail is very different than e-commerce, folks, regardless what the omnichannel experts suggest. Fifth, and this is the thing nobody has an answer for ... discounts and promotions are taxes placed upon brands for being unremarkable. This means that JCP generated between $4 Billion and $5 Billion per year of business that was discount/promotionally driven ... one out of four items was not sold because of a love of merchandise, but because of a perceived bargain. How does a company fix that problem while maintaining sales levels? What we've learned in the past year is that when we train a customer to purchase via discounts and promotions, we train that customer not to shop when we abandon that strategy. I see it all the time in my projects, now you got to see it in a real-life laboratory. This is so important, folks. I keep getting questions ... "What is the right promotional strategy to tickle the buying bone of the customer? Is it free shipping? Is it 20% off plus free shipping? Is it 40% off? Is it a gift with purchase?" These are valid questions. An equally valid question is this ... what is your exit strategy when you decide that you can no longer afford to tease customers with discounts and promotions? We've destroyed retail (stores + e-commerce + catalogs, the whole thing). We turned it into a game where chasing a promotional strategy is more important than identifying outstanding merchandise. The latter is terribly hard. The prior is, unfortunately, too easy, and impacts every employee outside the marketing department. So, here we are. We know that what JCP was doing prior to 2012 wasn't working well. We know that what was done over the past year-plus really didn't work - it couldn't possibly work given that the entire customer file craved discounts/promos like a drug addict craves drugs! You have to build a customer file of full-price customers, and that is VERY hard work. So hard, in fact, that almost nobody does it anymore. How do you get this business back to where it was - describe your strategy, and the benefits of your strategy? Once you get the business back to where it was, how do you fix the original problems that caused the business to veer in the direction it took in the past year? Show cases studies or links that defend your proposed strategy. Sure, I get it. It's entertaining to hear omnichannel thought leaders describe improbable versions of a gloriously digital future. It's more appropriate, however, to analyze your own data, and make your own decisions based on how your own customers are behaving. So let's do more of that. Take a look at the Mobile / Retail row of the table. These customers spent more money on mobile phones than any other channel. Take a look at where these customers migrate, in the future. This tells us a lot about how we'll prioritize future strategies. Retail, clearly, is the driver among this customer audience. For this business, retail isn't dying. Retail, instead, is the "sun" of this solar system. More important, however, is the relationship between mobile and e-commerce. Notice that, in the future, these customers spend twice as much via mobile as they spend via e-commerce. For this customer segment, the future aligns with an in-store experience supported with mobile. The e-commerce channel, surprisingly, is the one that is dying, not the in-store experience. This data is readily available in your customer database. Go analyze it! The secrets of your business lie in your own customer database.